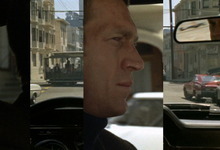 Chase has appropriated the masterful car chase scene from Bullitt . The manipulation of the scene’s images and sounds allows the viewer to discover the classic film scene anew. The reconfigurations expose the artistry of the sequencing of shots and edits and the rhythms of the scene.